Five Awesome Beauty Products under INR 200! Say what you may, I think shopping in a limited budget is fun. Above I have shared with you five awesome products that you can get for under 1000 rupees (around 16$) and still have money left to buy some candies, chocolates and maybe Maggi (I love Maggi actually)! So, is there a product you swear by which can be bought forunder 200 bucks? 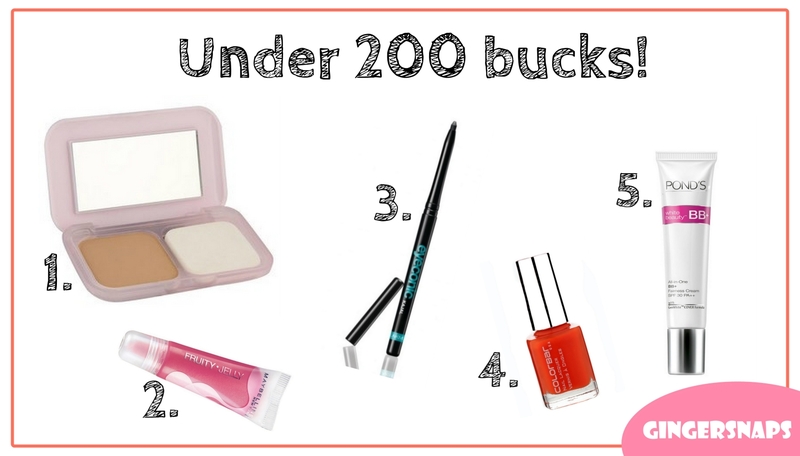 Great products :) Very useful post for makeup beginners! Yes hopefully this will be helpful for makeup beginners. Oh great. I have been wanting a BB cream for a while. Had no idea something so cost effect is there. Great selection babe. Love the color of the nailpolish! :)cute post! lacto calamine! 80 bucks per bottle. :) perfect sunscreen. And herbal kajals like Lotus and Himalaya are great for everyday looks, wash off easily.